A vascular screening test is a test that detects the presence of plaque in the arteries that can potentially lead to life threatening conditions such as stroke, aneurysms, or limb loss. At this time, ultrasound vascular screening tests are the only proven screening test to evaluate for diseases of the arteries. It is a painless, non-invasive test that uses ultrasound to detect the presence of plaque, enlargement, narrowing, or blockage of the vessels in the neck, abdomen, and legs. You will be lying on your back and our certified vascular ultrasound technologist will image portions of the carotid arteries in your neck, portions of the aorta in your abdomen, and portions of the arteries in your legs. The scan will take approximately 15 minutes. After the scan, you will receive a copy of the images with the report and information about the test for your personal records. You will also have an opportunity to sit down with the doctor who interprets the images (radiologist) and discuss your findings. The whole process will take approximately 30 min. No. There is no radiation with this screening test. Ultrasound studies use high frequency sound to create images of your body. The sound is too high for humans or animals to hear. There are no known risks of ultrasound. It is the same technology that is used to look at a baby inside a mother’s womb and is the preferred method of screening for vascular diseases because no radiation is involved and ultrasound provides information about the flow of blood inside the blood vessel itself. The combination of all vascular diseases (heart and other locations) account for the #1 cause of death in the United States, claiming over 600,000 lives every year. Unfortunately, these vascular diseases often come in pairs, affecting multiple locations (heart, carotids, aorta, and leg arteries). While there are no cures for vascular diseases, early diagnosis can lead to early treatment and prevention of the complications of vascular diseases, such as stroke, aneurysm, blockage, or heart attack. Early treatment can also prevent major surgeries such as heart surgery, aneurysm repair surgery, arterial bypass surgery of the legs, or even amputations. Ultrasound is the singe best way to screen patients who may have these vascular diseases. 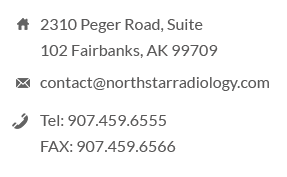 North Star Radiology is proud to offer this vital screening test to the community of Fairbanks. Is this screening test covered by Insurance? At this time, most insurance companies do not cover this important screening test. At North Star Radiology, we understand patients’ financial concerns and are offering this important test at a reduced price of $150, which includes the cost of the screening test, information about your test, a disc with the images, and a consultation with the radiologist at the time of the study.